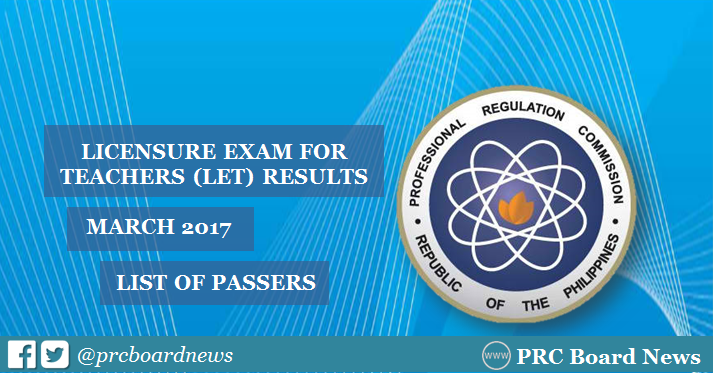 (Updated May 22) The Professional Regulation Commission (PRC) and the Board for Professional Teachers (BPT) released the official results of March 2017 Licensure Exam for Teachers (LET) or teachers' board exam for elementary and secondary levels on Monday, May 22 or in 40 working days after the exam. The complete list of passers, top 10 (topnotchers), top performing schools and performance of schools are all available on this page as announced online. A total of 5,600 elementary teachers out of 53,915 examinees (10.39%) and 18,482 secondary teachers out of 72,584 examinees (25.46%) successfully passed the Licensure Examination for Teachers (LET). The passing rate for both levels of exam this year was the lowest as compared to the previous examinations from 2013. It is further announced that of the 5,600 elementary teacher passers, 2,871 are first timers and 2,729 are repeaters. For the secondary teachers, 10,804 passers are first timers and 7,678 are repeaters. PRC administered the LET board exam on Sunday, March 26, in at least 18 testing centers nationwide including Bacolod, Baguio, Cagayan de Oro, Catarman (Northern Samar), Cebu, Davao, General Santos, Iloilo, Legazpi, Lucena, Manila, Puerto Princesa (Palawan), Rosales (Pangasinan), San Jose (Occidental Mindoro), Tacloban, Tuguegarao, Pagadian and Zamboanga. The BPT who gave the licensure exam for the expected more or less 100,000 takers is composed of Dr. Rosita L. Navarro, Chairman; Dr. Paz I. Lucido, Dr. Paraluman R. Giron and Dr. Nora M. Uy, Members. According to PRC, passing the licensure exam and having valid professional license are necessary before the practice of teaching profession in the Philippines. Otherwise, those who will violate may face fine and imprisonment based on penal provisions. The General Education is composed of English, Filipino, Mathematics, Science and Social Sciences subjects. Meanwhile, Professional Education tackles teaching profession, social dimensions of education, principles of teaching, education technology, curriculum development, facilitating learning, child and adolescent development, assessment of student learning, developmental reading, field of study and practice teaching. The field of specialization for Secondary level is either English, Filipino, Biological Sciences/Physical Sciences, Mathematics, Social Studies/Social Sciences, Values Education, MAPEH, Agriculture and Fishery Arts and Technology and Livelihood Education (TLE). PRC and the Board of Professional Teachers said that in order to pass the March 2017 LET, an examinee must obtain an average rating of not less than 75% and must have no rating lower than 50% in any of the tests. According to PRC Resolution No. 2016-1019 which deals with the 'Schedule of Licensure Examinations for Year 2017,' the target release date of March 2017 LET result is on Friday, May 19, 2017 or in 36 working days after the exam. The calculated total workdays excludes 7 Saturdays/Sundays and 3 holidays namely Maundy Thursday (April 13), Good Friday (April 14), ASEAN Summit (April 28) and Labor Day (May 1). A total of 54 calendar days or nearly two months was calculated. In the past 4 years for the same period, 35 days is the average number of days before the release of result for the average of 88,000 examinees and 31.14% passing rate. In March 2015 LET, results were released in 41 working days. PRC named a total of 30,938 elementary and secondary passers (32.28% passing rate). Meanwhile, the March 2015 results were announced online in 38 working days. A total of 30,007 out of 100,740 passed the examination (29.79%). On the other hand, January 2014 and March 2013 examination results were out in 32 and 27 working days, respectively. For March 2017 LET results, PRC Board News together with The Summit Express expect results to be released between May 10 and 24 (30-40 working days or in 7-9 weeks). Note: This projection originally appeared on PRC Board News. Copying to other PRC Board exam sites is not permitted. Note: This table originally appeared on PRC Board News. Copying to other PRC Board exam sites is not permitted. Based on the history of LET, the total days before the release of teachers board exam results correlate with the total number of examinees. For example, PRC was able to announce September 2015 and 2016 LET results in about 48 working days due to high number of test takers as compared to other schedules with less than 100,000 examinees. Note that some calamities or unwanted events which lead to cancellation of government work may add up to the waiting time of examinees. However, PRC has done some upgrades on their system to improve the process of checking the pencil-based examinations. Same with the previous LET examinations, PRC Board News will constantly update this page for the reliable and relevant information before the "big day" for future educators. Followers of this page may get the exact release date in few days or hours before the release of results. "When the 1st working day of the 7-day cycle mirrors an identical digit in the 5th lunar cycle of the year, LET the DREAM and the DREAMER become ONE..."
Our Guess: The fifth lunar cycle of the year happens between May 3 and May 26. The first working day of the 7-day cycle and the identical digit may be referring to May 22 (Monday). April 23, 2017 Update: LET results are out SOON. - source. May 3, 2017 Update: Latest riddle from Carl Balita hints of May 22 release of LET results. Isang 2 na lang, LET result na..."
May 8, 2017 Update: 2 Mondays to go before the release of LET results - source. May 20, 2017 Update : LET results are out online next week (possible on Monday, May 22). May 22, 2017 Update: Results are out! Congratulations to all passers! In the same period last year (March 2016), none of the schools qualified for the top performing school list for Elementary level as per Commission Resolution No. 2010-547 series of 2010. Meanwhile, University of the Philippines (UP) - Diliman topped the Seconday level exam with 93.44% or 57 out of 61 examinees passed. In March 2015, De La Salle University (DLSU)-Manila and University of the Philippines (UP) - Diliman were hailed as the top performing schools for elementary for getting 100% passing rate. The latter was the number one school for secondary level for the 95.24% passing rate. Which school will dominate March 2017 LET board exam? Rowena Miano Hingpit of University of Mindanao (UM) - Davao City aced the elementary level LET, 90.60%, during the March 2016 board exam. Michael Prince Notorio del Rosario from Lorma College is the current record holder for Secondary level, 92.00%.